Published on August 17, 2015 by Rachelle J.
Irona 700 by Dave Duncan – a review book. Harry Potter and the Chamber of Secrets by J.K. Rowling – for the HP Re-read I’m doing. Finished: The Lemoncholy Life of Annie Aster by Scott Wilbanks, which I’ll be reviewing sometime after Bout of Books 14. I also finished Judging a Book by its Lover by Lauren Leto, but I haven’t decided yet whether or not I’m going to review it. Show Your Shelves Some Love Progress: 33 out of 51. Outdo Yourself Progress: 53 out of 66. Netgalley/Edelweiss Progress: 14 out of 50. 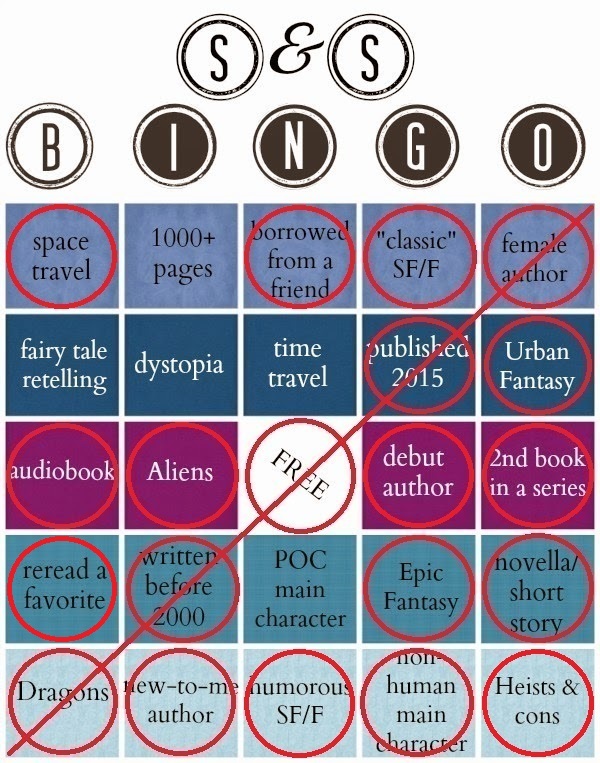 SF/F Bingo: I enjoyed The Merchant Adventurer by Patrick E. McLean so much that I convinced the Boyfriend to listen to it with me whenever we were in the car together. So, I’m counting it for the “re-read a favorite” square. Total # of books for the year: 54. Can you believe I’ve never read A Wrinkle in Time?! It’s been on my mental TBR since I came across it in my school library in the 7th grade. I finally got around to buying a copy when I was 30 and had started collecting books I had read or had wanted to read when I was a kid. Top Commenters: This week my Top Commenters were Terri @ Second Run Reviews and Shaina @ Shaina Reads. Next Bout of Books 14: Shhh, I’m Reading! I don’t think I’ve read A Wrinkle in Time either! I keep meaning to prowl around the kid/teen section in the library for it. I found out that the Boyfriend has never read it either. He said the cover of the edition in his school’s library creeped him out.